If you own a Sonos speaker you can now listen to YouTube Music through it. That is if you subscribe to either YouTube Premium or YouTube Music Premium. This gives fans of Sonos speakers yet another streaming music service to consider using. As music streaming services go, YouTube Music is the new kid on the crowded block. In May 2018, Google launched YouTube Music and YouTube Premium Google Launches YouTube Music and YouTube Premium Google Launches YouTube Music and YouTube Premium Google has launched two new services: YouTube Premium and YouTube Music. Except they aren't really new. This is more of a rebranding exercise for YouTube Red and Google Play Music. Read More . The former offers YouTube-centric music streaming, with the latter replacing YouTube Red. What differentiates YouTube Music from the competition is the onus on music videos. However, a YouTube Music Premium buys access to an audio-only mode (as well as ad-free listening and downloads). Putting it somewhat on a par with Spotify and Apple Music. Now, as detailed on the Official YouTube Blog, YouTube Music is available on Sonos speakers. 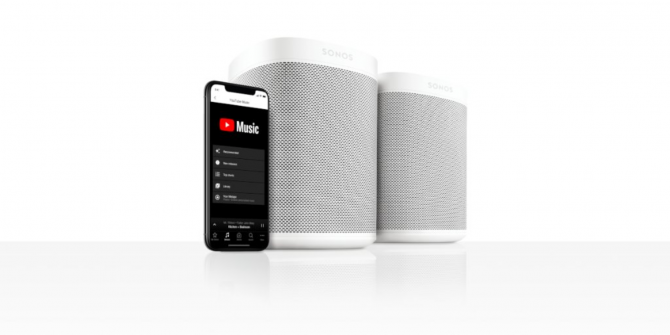 Essentially, this means anyone with a YouTube Music Premium or YouTube Premium subscription can now listen to YouTube Music through their Sonos speaker. Recommended, which features “listening suggestions based on your favorites”. New Releases, comprised of “the freshest music specifically tailored to your tastes”. YouTube Charts, which is “the best way to see what’s hot in music right now”. Your Mixtape, containing “your favorites and new songs we think you’ll love”. Library containing “your saved playlists, albums, and songs”. YouTube Music is available on Sonos in every country where YouTube Music and YouTube Premium are available. Existing subscribers should follow the instructions on this page to set up YouTube Music on the Sonos app. Everyone else can sign up for a 30-day free trial. YouTube Music cannot compete with Spotify and Apple Music in terms of the number of subscribers. However, with the might of Google behind it, plus the focus on videos, we wouldn’t bet against it carving out a sizeable chunk of the market. As for Sonos, we’re big fans of the speakers, with our Sonos One review Sonos One Review: Is This the One Smart Speaker to Rule Them All? Sonos One Review: Is This the One Smart Speaker to Rule Them All? Sonos and Alexa, in One device. Thanks to the superior sound quality, it's the best Echo device yet – and with Google Assistant support promised soon, it's the One speaker to rule them all. Read More suggesting this is “the one smart speaker to rule them all”. Which, with brilliant Amazon Echo and Google Home speakers also available to buy, is a huge compliment. Explore more about: Smart Speaker, Sonos, Streaming Music, YouTube Music.